Want to see your products reviewed here? Um…hello? Is this thing on? I’m not totally sure that this is a triumphant return to all that was Brassing, but if nothing else, maybe it’s a few pictures and possibly some words every now and again. Lots has changed. Lots hasn’t. Keep writing, folks. That’s why we all picked up a pen in the first place, right? Okay, so many of you may have visited my friend Dan Smith’s blog and learned that he grinds custom nibs and that he loves to restore Parker Vacumatics, but one day over lunch not too long ago, I asked him why he loved Vacs as much as he does. This was his answer. It’s a great read and he’s got some great eye candy in the article, too! Let me start off by saying this is not going to be an essay about why the Parker Vacumatic is the greatest pen in the word, because it’s not. It’s not even the greatest pen in the the world to me, but I am completely infatuated by it and it is and probably always will be the core of my collection. I suppose the main reason I collect Vacs is because there are so many different variations. What initially attracted me to the Vacumatic was the celluloid they’re made from. There’s so much depth and character to the celluloid. You can clearly see the difference between the real thing and a cheap alternative. The bargain pens that are made to look like the Vac celluloid look like an image has been printed on the pen. There’s no depth, no character, nothing special to them. One of my favorite aspects of the Vacumatic is there’s not a color I don’t like, but if I had to pick a favorite it would be a close call between the Burgundy Pearl and the Azure Pearl. The celluloid just mesmerizes me like a deer in headlights. And when you find one with excellent barrel clarity it makes it even better. My favorite Vacs by far are the first generation models with the section, blind cap, and jewels all made from the same celluloid, especially the oversize Vacs. My least favorites are the third gen, single jewel, plastic fillers. I don’t care for the non-jeweled blind cap, and the plastic filler looks out of place. If you get lucky you’ll find some with spectacular nibs. For me that means flex. I have two Vacs with super-flex nibs: a ’34 Silver Pearl Oversize and a ’47 Emerald Pearl Junior. I also have a ’38 Burgundy Pearl Shadow Wave with a semi-flex nib, which is the pen I used to write the first draft of this essay with. The one thing Parker deserves props for is building a solid pen. They were not intended to be fancy collectors items. They were designed to write and write and write and write. There’s not a single item on the pen that feels cheap (except for the plastic filler on 3rd Gen pens). They have good weight, feel great in the hand, and are very well constructed. Their system for dating pens was an ingenious idea. On very early models they used a two digit system where the first digit indicated which quarter of the year the pen was made and the second digit indicated the year. This system was used in the mid to late ’30’s. Parker then moved to a slightly different system where they utilized a single digit to indicate the year and then up to three dots around the number to indicate the quarter. Three dots = 1st quarter, 2 dots = 2nd quarter, and so on with no dots meaning the pen was made in the fourth quarter. It was done this way so that Parker could grind one dot off the stamp and keep using it throughout the year. I wish more pen companies had implemented some type of system to accurately date their pens. So now that I’ve gushed about all the good, its time to bring it back to reality because there are a few things about Vacumatics that I can’t stand. The biggest being the filling system. Go figure. The filling process is so tedious and time consuming, especially if you’re trying to clean the pen out to switch colors from, say, black to orange. Thank God the lock-down filler only lasted as long as it did. Why didn’t they just start with the speed-line filler? Who knows, probably for the same reason it took Apple until 3.0 to get copy and past and MMS into the iPhone. The thing that bugs me the most about the lock-down filler is that once you have the pen completely filled you have to push the filler back down, emptying a good amount of ink in the process. The other minor thing I don’t care for is the Vacumatic cap band. Not the cap band with the actual word “Vacumatic” stamped into it but the one with all the stupid ///\\\\///\\\. The triple, and even the double, cap bands were so much more elegant. Oh, and I’ll take mine in silver, please. So, should you go out and try to find your next vac, or maybe for some of you your first one, on ebay? No, you should buy one that is restored and polished by me (what a plug, eh?). Seriously though, Vacumatics are not for everyone. I collect them because there are so many variants and quirky uncatalogued pieces. Its easy to start collecting them yet some people may never have a what can be considered a comprehensive collection even after a life time of collecting, unless you’ve got some serious cash to drop. If you want my recommendation, go out and find a really good example of a first or second gen Vac and play with it for a while. You’ll either be in love or it’ll just get a “meh” from you. If you really want to get into some cool items then look for the desk sets made entirely from the stripped celluloid. Or, the Ripley versions made from alternating Burgundy Pearl and blue celluloid. Then, there’s the Imperial (one of my grail pens) which is sort of a 51 with a traditional nib and made from celluloid, or you could think of it as just a Vacumatic with a slip cap but closer in dimensions to a 51 than any Vac. So there. In case you ever needed a great reason (or three) to buy a Vac…I think you just read it! Sorta stands out, doesn't he? Remember kids…only YOU can prevent nefarious malfeasances towards unsuspecting inks. For quite a while now, many of you have known that I’m good friends with James Partridge, owner of The Pear Tree Pen Company…but here’s something that’s probably new to you! I’m delighted to announce that effective immediately, I’ve assumed day to day management of operations for The Pear Tree Pen Company! Yep…you read that right. The Pear Tree has been re-planted in the middle of Corn Country! The Pear Tree Pen Company is pleased to announce that Ryan Roossinck has assumed management of the day-to-day operations of the successful online retailer. Roossinck is known among fountain pen and ink enthusiasts for his popular internet blog, Brassing Adds Character, where he reviews writing instruments and accessories such as pens, pads, and inks. He is also known for his role as a moderator on the Fountain Pen Network, the largest online community of fountain pen and ink lovers on the internet. Pen collector James Partridge founded the Pear Tree Pen Company in 2006 as a part-time home-based business. Following the introduction of the Fountain Pen Ink Sampler later that year, business began to boom leading the fledgling operation to seek larger quarters. Pear Tree Pens moved, literally, from the kitchen table to the basement, and shortly thereafter opened a larger retail and order-processing facility just north of downtown Ann Arbor. Despite the tough economic times, the Pear Tree Pen Company continued to prosper, and even hired several staff members to help ship packages to thousands of customers around the world. Unfortunately, splitting his time between his full-time career as a corporate attorney and managing the burgeoning online establishment began to take its toll on Partridge. “I realized that it’s impossible for me to do it all. I can’t excel in my legal career, grow the Pear Tree Pen Company, and spend as much time with my family as they deserve.” Partridge began to explore selling the business, and even considered simply shutting its doors. In anticipation of the future, both James and Ryan have their shades ready. Get yours out. So…what happens now? Well, for me…lots of things. I’m still intending to run Brassing Adds Character as a semi-separate entity, and I’ll still be covering lots of the same topics that you’ve seen from me before; features on vintage pens that you may not have seen before, hacks & how-to’s, and the occasional review of a pen that strikes my fancy. You might see a few more product announcements here and there, but my intent is to keep Brassing operational as a non-commercial site. If/when I do another roundup/best-in-class feature, etc., you’ll still find links out to eBay and other sites that sell the pens & products that I review. If it’s something that we sell in our store, or it’s something that you can’t get anywhere else…you’ll find links for that stuff, too. I would ask that in the interim, while I get used to “minding the store”, that you’d be patient with us. Our dedication to a great customer experience remains the same, but let’s face it…there’s a bit of a learning curve that I’m going to deal with, and I’d appreciate your cooperation! Along those same lines, I’d also ask that we keep Brassing conversations focused around Brassing topics, and go back-channel for Pear Tree stuff. Thanks! Tight on time today, kids, but I wanted to whet your appetite a little bit about a couple of incredible pens that I’ve been playing with for the past couple of days. Varuna is an Indian company that makes ebonite pens, and I frankly couldn’t believe the quality that they pack into these things…especially for the price! These things are truly outstanding! Great nibs, gi-normous ink capacity, and REALLY cool finishes! For less than $50 with a steel nib that writes this well, it’s really hard to go wrong! I’ve got a full-scale review planned for these next week, comparing the Danitrio Densho raw ebonite to each of these two big eyedroppers from India…but for now, here’s a couple of quick shots of them side by side. The Bakul finish compared to a Lamy 2000. If you’re headed to NYC for the pen show, you should take a look at these things. Look for Steve Braun’s display and his big smile. I know Steve, and he’s a top-notch fella! 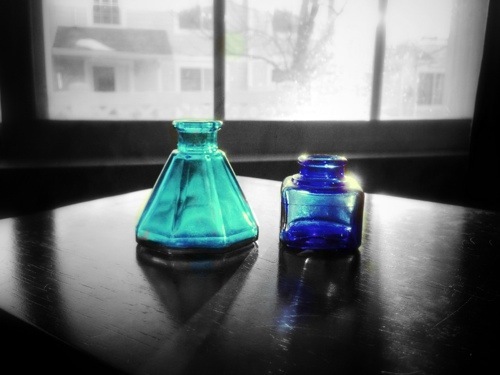 The smooth matte finish Vishal eyedropper compared to the Danitrio Densho. 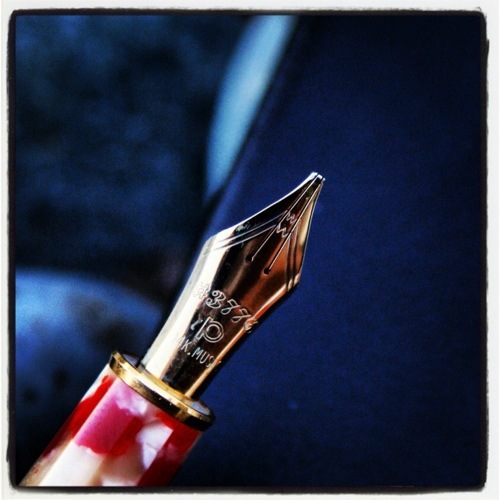 Guest post: Why your first vintage pen oughtta be an Esterbrook! So, without further ado, here’s a few thoughts (and some scrumptious photos) from Bruce about why Esterbrooks should be high on your list for a first vintage pen. Thanks, Bruce! I knew I could count on you, and I really appreciate you stepping up! When the time comes for you to consider your first vintage fountain pen, the multitude of examples still readily available from the various 1st, 2nd and 3rd-tier pen companies popular during the heyday of fountain pens can be stupefying. Though the name Esterbrook may not come to mind as quickly as the more recognizable names such as Parker, Sheaffer’s or Waterman’s, I feel there are numerous reasons why and areas where Esterbrook excels above all the others. In the areas of variety, lasting quality, durability, ease of repair and restoration, cost and especially adaptability, you’ll be hard pressed to find another pen company that can provide today, in their vintage pens of yesterday, what Esterbrook can. The most widely available J family series of Esties came in 10 different colors and 3 different sizes. There are the SJ and LJ models, both slightly thinner with the SJ being a bit shorter for those with average to smaller hands. The “full sized” J comes pretty close to the size of many modern fountain pens. Almost all of those colors and sizes also existed in the Dollar pen family by Esterbrook that preceded the J family though being older, the Dollar family is a bit harder to find today. Combining all those colors and sizes gives you a range of possibilities unequaled in my opinion by any other pen maker. While Esterbrook not only had more colors than most any of the other pen makers, they also had more patterning variations within those colors. Most of the other pen companies were very set and unvarying in their colors and patterns so many of their pens in the same colors look exactly alike. With Esties it’s very likely you can find a variance in color and patterning that you won’t see exactly duplicated in 10 other pens of the same color. Note the variations in the celluloid of nearly identical pens! While during their heyday, The “big three” of pendom were courting the customer looking for a “pen of distinction” or a “fine writing instrument”, Esterbrook (IMO) was content to be “the people’s pen”, the (original) VW Beetle or Ford Mustang of fountain pens if you will. While the big three were fighting it out amongst the individual pen consumers with their visulated celluloids and gold plated (and filled) trim, Esterbrook was selling millions of simpler, less flashy, much less expensive pens to the monstrous Bell System (phone) monopoly, AT&T, AAA Auto club, various school systems nationwide and the “Joe (and Jane) Sixpacks” of the day. While most of the other pen makers were wowing their customers with visulated celluloid that ambered as it aged and changed colors due to the outgassing from their ink sacs, Esterbrook used a very durable opaque celluloid that is immune (for all intents and purposes) to those color changes and ambering. While other pens’ gold plated (and filled) clips and trim rings looked distinctive and “rich” in their prime, today many are discolored, worn and brassed, while Esterbrook’s “plain jane” stainless steel furniture soldiers on looking in many cases as clean as the day it was made over 50 years ago. Even with an internal component as simple as the latex ink sac, some how Esterbrook managed to excel over their competitors. It is very common today to see Esties with their perfectly pliable and serviceable 50+ year old original “Esterbrook” stamped latex sacs, while the other pen company’s sacs crumbled to rattling chips long ago. You might wonder where the prior mentioned trait of “adaptability” enters in as that’s not a word you might normally see associated with fountain pens. It comes into play with the manner Esterbrook chose to nib their pens. While the other makers were “blinging” their customers with 14kt gold single and dual toned nibs, Esterbrook stuck to the same theme of stainless steel it did with its clips and trim. Now, don’t be lured into the “Snootinista” position of “it’s got to be a GOLD nib to be a GOOD nib”; that simply just isn’t the case. 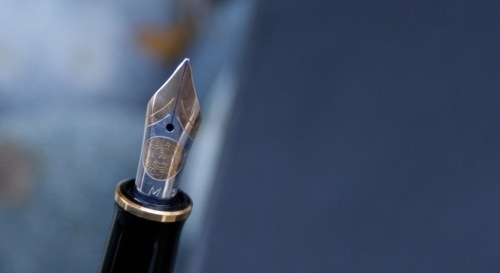 A properly aligned steel nib can write just as smoothly and flow just as well as any gold nib. Esterbrook called their nibs “Re-New Points” and at times there were as many as 52 different Estie nibs available (yet ANOTHER benchmark no other pen maker could touch). Any and all of the Re-New Point nibs can easily be screwed into all the Dollar and J family pens by the user. Therein lies perhaps the most effective “secret weapon” that makes the Esterbrook such a winner in the vintage pen arena. With almost all the other vintage pens, you are “stuck with” the nib the pen comes with. While you can have those nibs re-tipped or replaced by a pen repair person you are usually looking at a minimum of $50 to do that. (Be sure you make the right choice there, it’s at least ANOTHER $50 if you choose a replacement nib that doesn’t “fit” you.) That same $50 can easily buy you 3-6 different NOS Esterbrook Re-New Point nibs that you can swap around at will in a minute or two yourself. (Very few if any of the replacement nibs available now for vintage big three pens will be NOS, almost all will be used nibs.) While they are somewhat pricier, in the $25-35 range, there are even flexible Estie nibs available <though some may rate them as only “semi-flexible”> when during the day, the big three weren’t generally fitting flex nibs in their pens. The ease with which an Estie can be repaired or restored makes their wide availability on eBay a big boon to Estie lovers. Though it probably wasn’t purposeful at the time, the materials Esterbrook used and the way they assembled their pens make it especially easy for even a non-skilled, non-mechanically inclined person (like myself) to not only bring an Estie “back from the dead” but yes, even easily return them to looking and writing as nicely as the day they were made. Speaking of “”Why I Like Esterbrooks”. When Ryan and I originally discussed this piece, that was the title he suggested. I, in turn suggested “Why an Esterbrook should be your first vintage pen”. Hopefully, you can now see that the reasons for each scenario are pretty much the same. You should be warned though, around the Esterbrook forum on the Fountain Pen Network, Esties are compared to Lay’s potato chips. Just like the chips, once you get one you can’t stop yourself at just one. Notice anything different about this little Aurora 88P? I’ve owned this one for a while now, and really enjoy it (the vintage Aurora 88 models are absolutely top-notch pens), but I really got tired of it showing fingerprints all the time. So, one night while watching TV, I decided to give it a satin finish. Out came the abrasives, and a few hours later I had a nifty satin-y finish that feels GREAT in the hand, looks really elegant (the satin & chrome combo really looks good, in my opinion), and is almost impervious to fingerprints! Since the 88P is an all-celluloid model (there were a handful of different versions of the 88 – read my friend Andrea’s outstanding profile of this iconic pen here), it took the satin finish very nicely and very evenly, too. The best part about it is that it’s totally reversible with a little bit of polishing (I didn’t remove much material at all, so it should be able to be polished back out to a glossy finish without disturbing the imprints on the section). At any rate, it doesn’t take much to do this, so if you’ve got a pen that you want to experiment with, grab some soft abrasives (I use these in 1000, 2000, and 4000 grit) and start with the finest grade and work backwards until you get the finish you’re looking for! Experiment with wet and dry sanding, and see what happens! You might be surprised the way your pen responds to a satin finish! Lamy 2000: Did you know? My Life As a Verb.